It has been a while since I’ve posted — the closer it gets to blowing this American pop stand at the end of December, the more I have felt the need to take a break from blogging. I’ve posted a map of the Indian state where I will be waking up less than two months from now, and believe me, it can’t come soon enough. I’m going to a wedding in Chennai, and although it won’t be a Hindu wedding, I’ll still wear a sari. It is the wedding of my friend’s son and she said I can borrow one of her saris. She has already told my usual rickshaw driver that I am returning and she said he is happy I am coming back. He has three young daughters, and I want to bring them silly presents. They will be a big hit in their neighborhood when they walk around blowing bubbles from those soap-in-bottles I’m going to bring them. Maybe it’s time silly string hits Chennai. My friend calls me “akka” which is “older sister” in Tamil. I call her “thankachi” which is “younger sister”. My thankachi told me she can not wait to see me, she has much to tell her sister. She loves birds and listening to them, so I am bringing her a DVD of Midwestern birds. Then I spend five days at my yoga school in private classes — asana, pranayama, meditation, and a Sutras class. One of my students is meeting me, he is bringing his girlfriend, and they have never been to India before. I told him a long time ago that I don’t mind him meeting me as long as he doesn’t cramp my style. We will all take the classes together at the school and I will do things with them everyday until I feel stifled and encumbered by them, then it will be time for me to be alone. I have found a Buddhist temple in Chennai that I want to visit everyday, along with a Kali temple, jai ma! 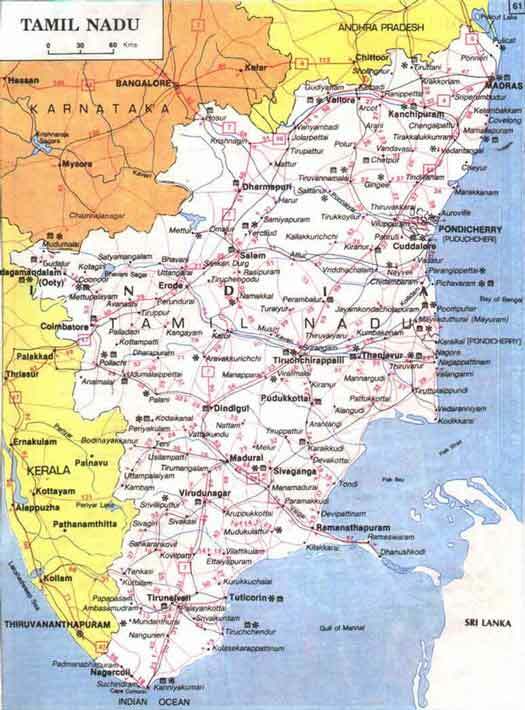 After 10 days of Chennai (Madras on the map), I will tell my student what bus to take to Pondicherry and I will tell my driver to take him there, then I hop a 10:30 pm train that takes me off the beaten path in Tamil Nadu so I can explore temple towns. Not before I get mehendi on my feet though. My student and his gal will have to make it back to Chennai on their own, because I will be long gone. But he’s a big boy, I went to India the first time all by my lonesome and this woman of a certain age was fine. More than fine. If you click on the map, you can see a route that meanders down to Madurai, where I will hop on another train to take me Kerala, on the other side of South India on the Arabian Sea, where I have never been. I plan on lots of yoga and ayurvedic massage. And being alone. Another new experience for me will be flying domestically in India — I’m flying back to Chennai from Kerala. A 90 minute flight costs $75. I do not belong here. Ma India, I’m coming home. That all sounds just lovely. Someday I’ll go there myself. I can’t wait! sierra….there is truth in what you say. but home is where the heart is, and my heart is in India, and has been, ever since my foot hit Chennai soil in 2005.I know that I will not die in this country.shanti, and thanks for reading. I just asked in another post when you go and now I paged down and know.This is so wonderful- your spirit comes alive in your posts when you talk about India.